Perhaps no Mustang was sweeter than the original 1964 model. It had great proportions, was very quick and reasonably agile for an American car of its day. But it certainly wasn’t mean–like the Fastback GT. 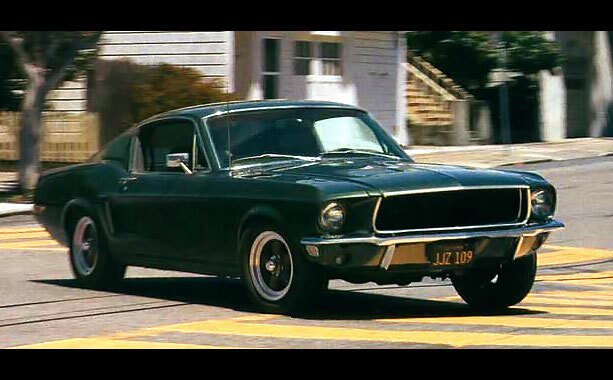 That car, the one Steve McQueen Steve McQueen made hugely popular by driving in the tough-guy classic film Bullitt, had a blacked-out grille, a huge, 390-cubic-inch engine good for 325 horsepower, and American Racing wheels that gave it a street-rod style. 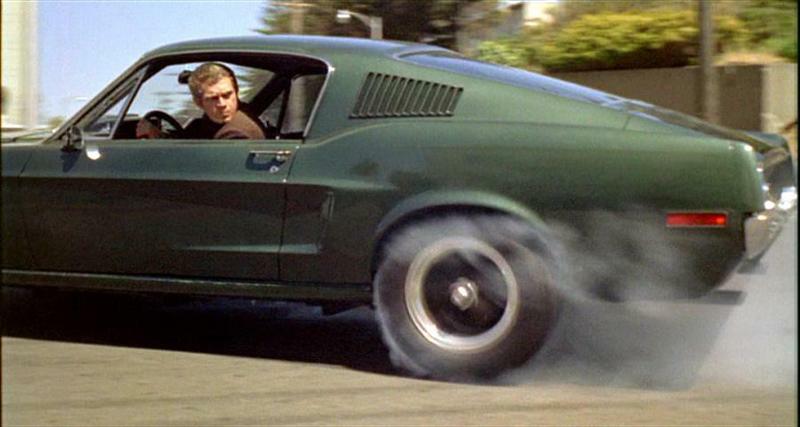 The Bullitt Mustang, along with the 440 Charger R/T that Detective Frank Bullitt (McQueen) eludes in the famous chase scene through San Francisco, may have more to do with the subsequent popularity of muscle cars than any marketing decision made in Detroit or on Madison Avenue. Although the Fastback GT became immensely popular, it was by no means the best Fastback Mustang. The car Steve McQueen drove had a 390-cubic-inch V-8 and a four-speed manual transmission, but the various Shelbys, Bosses, Super Cobra Jets and GT500KRs were all more powerful cars, for instance the Super Cobra Jet produced 360 bhp. Today, a mint Fastback GT can be had for under $40,000, while the much rarer, collectible Shelbys fetch an easy figure of $80,000 all the way up to $150,000 for some examples. You can still have that classic look without having to pay collectors car prices, if your lucky. There were actually two stunt cars used in the film, one of which went to the crusher because it was too badly beaten up to sell. The other car was sold in the early 1970s for $6,000, then sold again in 1974. McQueen heard of the car being sold to a man in New Jersey, and called the new owner in an effort to persuade him to resell the car. The buyer refused, but promised to call McQueen if he ever changed his mind. Unfortunately the great Steve McQueen died in 1980 without having heard from the owner. Even to this day the owner has refused dozens of requests for the car. If it was yours would you sell it? I wouldn’t that’s for sure, the car is part of an elite club of automotive classic cars. The current state of the car is said to be unrestored, but the location of the surviving Mustang is largely unknown, but it has been rumored many times that the Mustang is kept in a barn in Ohio River Valley. The total time of the scene is 10 minutes and 53 seconds, beginning in the Fisherman’s Wharf area at Columbus and Chestnut, followed by Midtown shooting on Hyde and Laguna Streets, with shots of Coit Tower and locations around and on Filbert and University Streets. The scene ends outside the city at the Guadalupe Canyon Parkway in Brisbane. The two Mustang GT fastbacks were loaned by the Ford to Warner Bros. as part of a promotional agreement. The Mustangs’ engines, brakes and suspensions were heavily modified for the chase by veteran car racer Max Balchowsky. 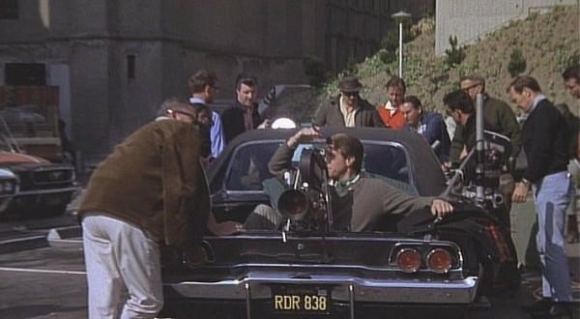 Ford also originally loaned two Galaxie sedans for the chase scenes, but the producers found the cars too heavy for the jumps over the hills of San Francisco. They were replaced with two 1968 375 bhp 440 Magnum V8-powered Dodge Chargers. 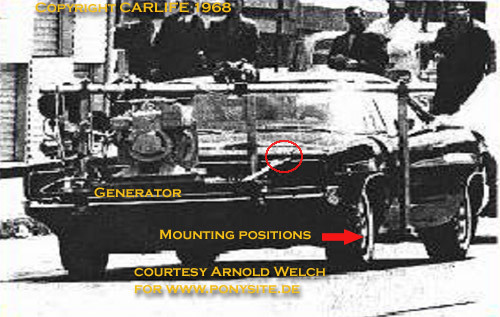 The engines in both Chargers were left largely unmodified, but the suspensions were reported to be mildly upgraded to cope with the demands of the stunt work. The director called for maximum speeds of about 75–80 miles per hour (121–130 km/h), but the cars (including the chase cars filming) at times reached speeds of over 110 miles per hour (180 km/h). Driver’s point-of-view shots were used to give the audience a participant’s feel of the chase. Filming took three weeks, resulting in 9 minutes and 42 seconds of pursuit, first of Bullitt by the hitmen then the other way round. 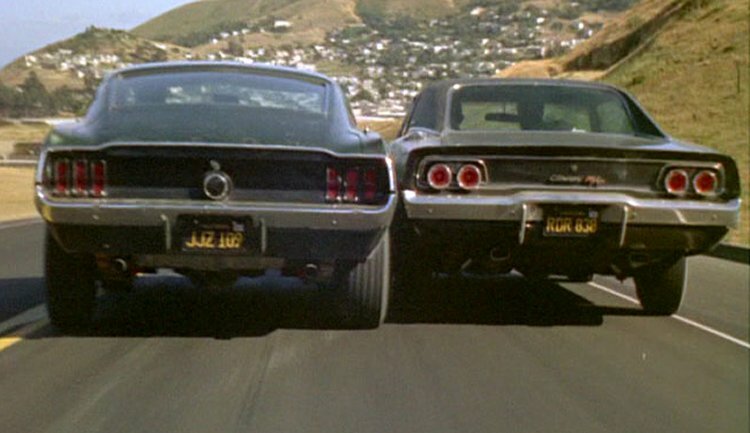 Due to multiple takes spliced into a single end product, heavy damage on the passenger side of Bullitt’s car can be seen much earlier than the incident producing it and the Charger loses five wheel covers, with different ones missing in different shots. Shooting from multiple angles simultaneously and creating a montage from the footage to give the illusion of different streets also resulted in the speeding cars passing the same cars at several different times. At one point the Charger crashes into the camera in one scene and the damaged front fender is noticeable in later scenes. Local authorities did not allow the car chase to be filmed on the Golden Gate Bridge, but did permit it in Midtown locations and said to be including the Mission District, and on the outskirts of neighboring Brisbane. McQueen, an accomplished driver, drove in the close-up scenes, while stunt coordinator Carey Loftin hired stuntman and motorcycle racer Bud Ekins and McQueen’s usual stunt driver Loren Janes for the high-speed part of the chase and other dangerous stunts. Bud Ekins, who doubled for McQueen in the The Great Escape sequence where McQueen’s character jumps over a barbed wire fence on a motorcycle, also lays one down in front of a skidding truck during the Bullitt chase. The Mustang’s interior rear view mirror goes up and down depending on who is driving; when the mirror is up McQueen is visible behind the wheel; when it is down Bud Ekins was driving. The black Dodge Charger was driven by veteran stunt driver Bill Hickman, who both played one of the hitmen and helped with the chase scene choreography. The other hitman was played by Paul Genge, who had ridden a Dodge off the road to his death in an episode of Perry Mason – “The Case of the Sausalito Sunrise” two years earlier. In a magazine article many years later, it was supposedly said by one of drivers involved in the chase sequence, that the stock Dodge 440s were so much faster than the Mustang that the drivers had to keep backing off the accelerator to prevent the Dodge from easily pulling away from the Mustang.